This one has been rather brutal and I've logged more treadmill miles in the past few months than I have before. While I'm appreciative to have the option of getting in my miles on the treadmill, I still enjoy getting outside in the fresh air. I've been intrigued by snowshoe running for some time now. But this winter, I decided to go for it and so I did. In my doing so, I've learned a few things along the way. First and foremost, you need snow. Once you have that, you are halfway there. Next you need to find a location. If you don't have a place around your house, you can find a trail in your area. Some areas have existing parks or trails where people can go snowshoeing. Trails.org is a great link to find trails in your area. Unfortunately for me, all of those green trails are no very local for me. But, I was surprised to see how many trails there are in Maine. I'm sure there are more that are not included on this site. If there isn't an existing trail in your area, make one! I am fortunate that we have a bit of land - one lap around our property is about .34 miles making 3 laps = 1 mile. I'm not a huge fan of laps like this BUT the kids can hang out inside, play outside, or even join me. Which, for me, makes snowshoe running just even more of a bonus. My first couple of laps are the hardest - mostly because I'm trailblazing. This last storm dumped a ton (well, over a foot) of heavy wet snow. This can quite challenging in snowshoes, but don't give up! You'll feel badass afterward, so it's definitely worth it! My pace for the first lap was a 23 min/mile. Crazy slow. But my heart rate was pumping, so I knew I was getting in a tough workout. It took two laps to make an acceptable trail this time, but I did it. Then I went on to do 4 more laps to get in a total of 6 laps = 2 miles. If you can, make the trail wide. If the snow freezes, you don't want your snowshoes to get caught on ice, which will then cause you to fall. Trust me. This happens. Instead, take your time and make the trail wide! There are specific running snowshoes on the market. I didn't want to spend the $$ on another pair of snowshoes for something I may or may not like. Instead, I used my kid's 19 inch snowshoes - which are 2 inches shorter than mine and a bit narrower. I've read that some running snowshoes are narrower, more contoured and shorter than traditional walking snowshoes. Granted my child length snowshoes aren't contoured - but they are shorter and narrower which was 1/2 the battle. 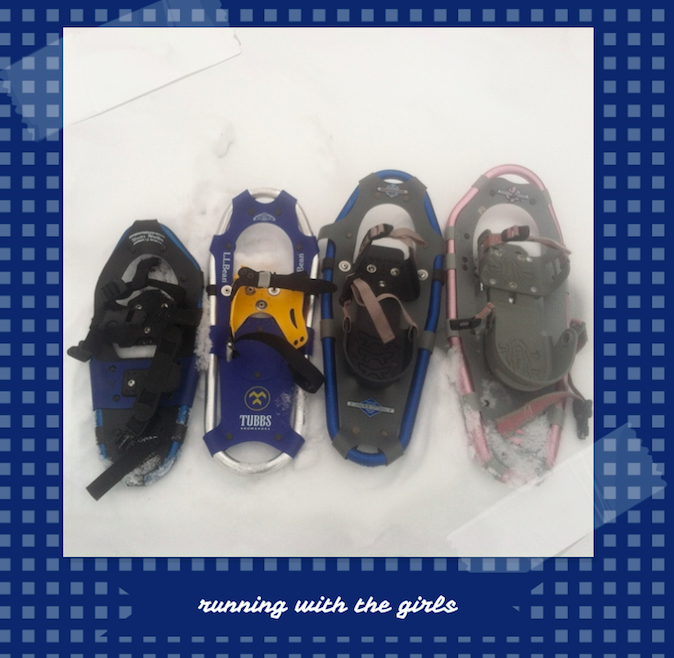 My first few times snowshoe running, I chose the blue 19 inch snow walkers from LL Bean. They were okay. When I tried to increase my speed, I noticed I would hit the inside of my calf with the snowshoes. The last time I went out, I chose the blue Tubbs, which are also 19 inch snowshoes. They were lighter and a lot narrower - which I found to be much more efficient. Not great trailblazing snowshoes - but excellent for the actually running part. Outdoor winter activities can be challenging. The thermometer could say one thing but if there is wind, that windchill really has an impact. This has been the winter of crazy cold wind chills and layering up has been very important. I usually start off with warmer layers and then take them off if I have to. Fortunately for me, I'm snowshoeing on my own property, so I just drop off my layers in the driveway after I make a loop. Because you are running in the snow, I choose to wear my running shoes and high warm socks. You could put on gaiters, if you chose. But I have found calf length Smartwool socks to be pretty awesome in keeping my feet warm and dry. 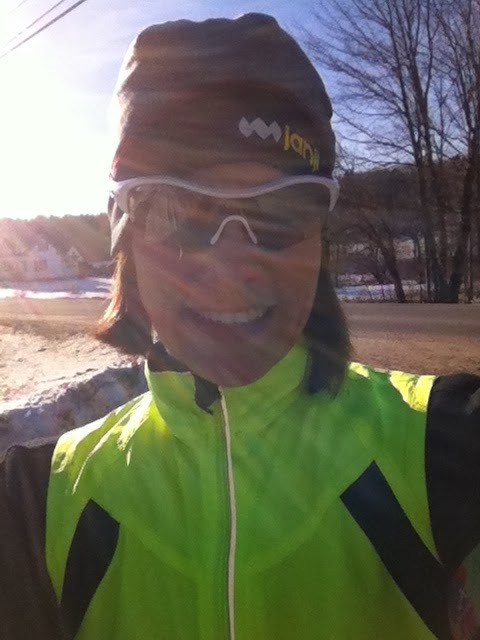 If it's a little warmer out - I really enjoy my compression socks - like these Zensah neon green ones. They match my Spandits perfectly. I've also realized that sunglasses are much needed. Snow is highly reflective and can be blinding. I've found that it's hard to see where I'm going without sunglasses on to cut down on the glare. Eye protection is still important even in the winter. 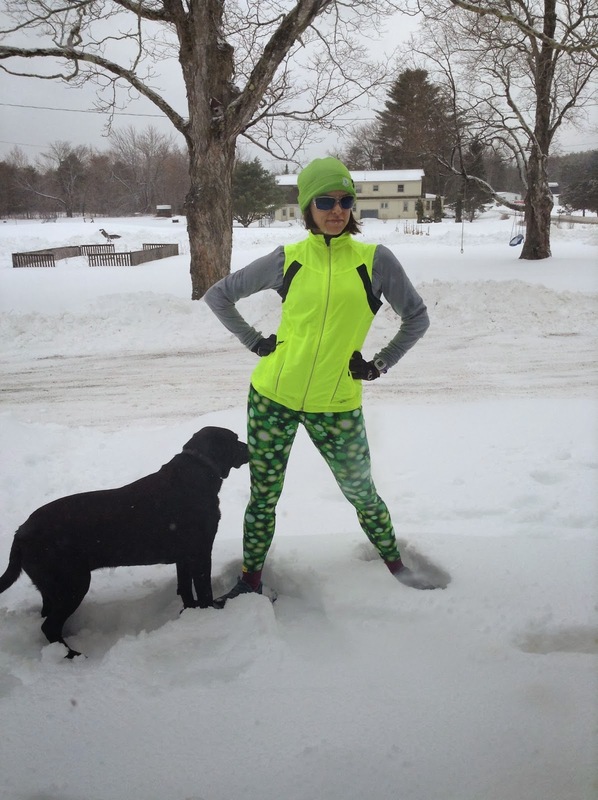 In all honesty, running with glasses on in the winter is great even if you aren't running on the snow. We have so much sand/salt on our roads and when a vehicle drives past me, I always get pelted with the flying sand/salt in my face. It hurts like crazy. Sunglasses will protect your eyes for sure. I've read that snowshoe running is more comparable to trail running or running in the sand when compared to running on paved surfaces. I've also read that you tend to burn 1.5 to 2 times more calories running in snowshoes. Here is a comparison of 2.05 miles snowshoe running vs 2.05 miles road running using the Armour 39 heart rate monitor. Snowshoe running will take more time: 37:30 minutes vs 19:45 minutes. Actual calorie burn will vary from person to person. The Armour 39 is calibrated to my weight of 140 lbs. I know of one Snowshoe race series in the area. Unfortunately, I have not been able to make it to one. But, I see that there is one on March 9th. If we still have snow (which at this rate, I'm sure we will), I might need to get there and try it out! 7. DO IT WITH A FRIEND/RUNNING BUDDY. If you are unable to get to a race or don't have a race in your area, then run with a buddy. My buddy of choice has been Pepper. She gets to run with me leash free. She's only tripped me once. I'm hoping it wasn't on purpose! 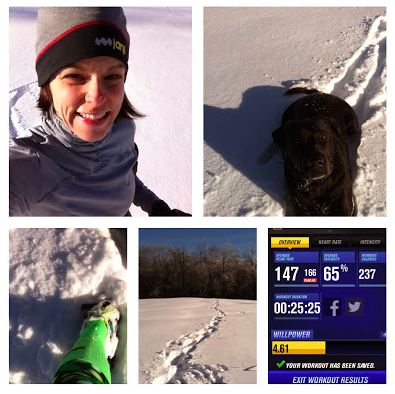 Have you tried snowshoe running? Anything tips you have? Disclosure. I'm not a snowshoe running pro. Not even close. 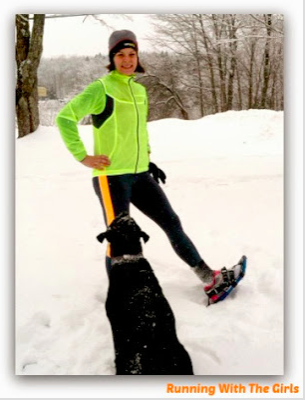 But if you are looking into trying out snowshoe running, these steps will get you started. I've never run in snowshoes, but have been seeing more and more about it this year - definitely intrigued. We still have close to a foot of snow on the ground (though it will melt over the next few days) ... but if more comes I might have to give it a trye! I bet you would love it. It's slower but harder. Very happy you thought my post was informative!! !